The stomata open at night. The CO, enters into the leaves. It combines with Phosophoenol pyruvate to form oxaloacetate. This reaction is catalyzed by the enzyme PEP carboxylase. The NADPH, reduces the oxaloacetate to malate. This reaction is catalyzed by malate dehydrogenase. Most of the malate is stored in the vacuole during night time. Stomata are closed at day time to prevent loss of water. Therefore, the entry of CO, is also stopped. The malic acid diffuses out of the vacuole into the cytoplasm. It is broken and it releases pyruvate and CO,. Pyruvate reacts with ATP to regenerate PEP. The CO, enters into chloroplasts. 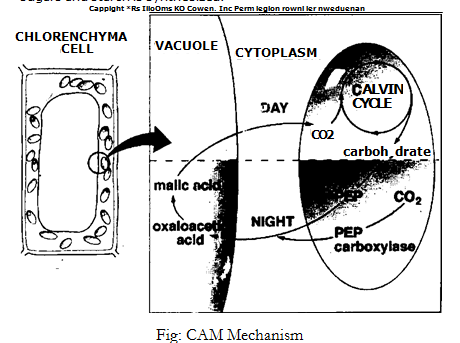 It is fixed by Calvin cycle. Thus sugars and starch is synthesized.